From Newport to New Haven to a New Road Trip! April arrived in full force both the weather and the schedule! Northern Vermont was shrouded in the winter that didn't want to end as we survived the endless grey days of cold wind, rain and snow...we still aren't sure spring will really arrive this year in Vermont! Despite the weather, I was in overdrive, wrapping up my last sessions of classes with my beloved students, prepping for my first college visit to present my Postcards from the Parks project, and wrapping up the details for PFP Road Trip #2. Needless to say, the first half of the month flew by and suddenly it was April 18th! I polished my presentation, packed my car with artwork and photos, and made my way from the Grey (formerly Green) Mountains of Northern Vermont to New Haven Connecticut and Yale University. I can't imagine a better way to kick-off what I hope to be a long list of college visits than to have to opportunity to share my journey with Professor Monica Bravo's Visual Culture of the National Parks class. The students were a wonderful medley of majors representing a great cross section of the student body along with a few additions that chose to sit in on my presentation. For 2 hours I shared both my work and my experiences on the road, my passion for preservation of public lands, as well as my future plans, and long term goals for the project. I then opened it up to questions and these young people didn't hold back - their questions were deeply thought, controversial at times, and kept me on my toes...it was fabulous! These students represent a generation of young adults that give me hope in the bleak political climate of 2018. I wrapped up my session by scattering over 60 8x10 black and white photographs from my first road trip and asked them each to choose the one on the table that spoke to them. It was interesting to see how some chose right a way while others contemplated and compared. I then asked them to try to verbalize what it was about that particular image that spoke to them - was it the composition, the subject matter, was if foreign or familiar, did it remind them of a memory or personal experience? I quickly had many volunteers to share why they had chosen theirs and the reasons varied across the board. I then explained what it was like to be out in the Parks in some of the most beautiful and diverse landscapes in the country and even the world, there were thousands of views and vantage points from which i could have painted or photographed, but I had to chose just a few to share with people to try to catch their attention and awaken them to these unique landforms and habitats in hopes that then then will be inspired to step up and act to help protect them with me. At that moment they got it and curiously looked around to see what others had chosen and how unique each person's choice was. As time was wrapping up, I gifted them the photo they had picked, hoping they would hang it in there dorm room or apartment and be reminded of the treasures we have in our National Parks and Monuments and it is up to all of us to stand up and protect them. I then got the pleasure of ending my day celebrating my first college presentation with my daughter Amy (a freshman at Yale) and her friends, then getting a personal tour of the Yale art gallery by Amy, one of the their newest gallery guides! If that wasn't enough excitement, I headed home the next day to have just 2 days to pack all my gear to hope on a plane - destination: Oakland, California and the start of PFP Road Trip #2! This was not an easy task considering I needed all my painting gear, camping gear, computer and camera equipment, clothing for the high desert, and warm clothes for extended winter temps in the Sierra Nevada Mountains. Two bags weighing in at 100 pounds exactly, a much to heavy back pack, and computer bag in tow and I was on my way! 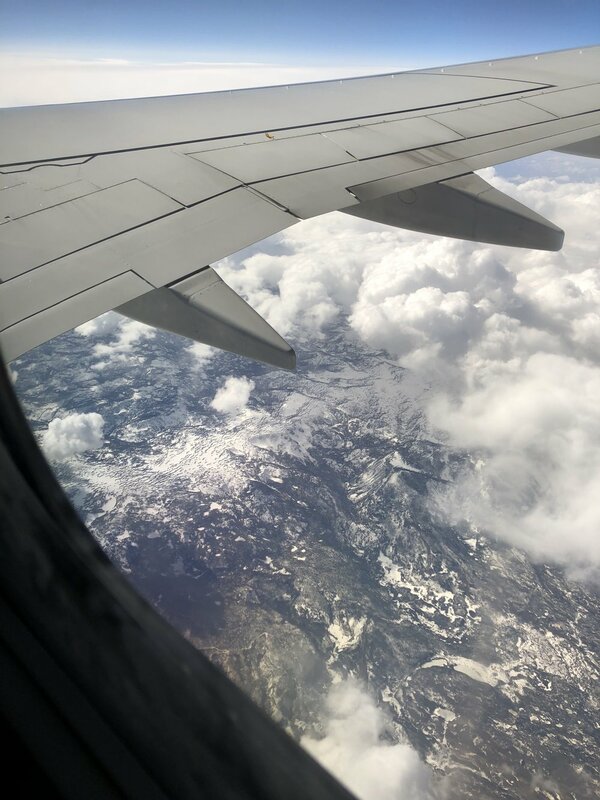 From my window seat I was able to literally watch as the landscape transformed beneath me! 12 hours later I landed in sunny California and thanks to a very generous car rental arrangement from Hertz who got behind my project, I got behind the wheel of a nice new Jeep Grand Cherokee and hit the road for a 10 hour drive to Southwest Utah and Zion National Park where this new chapter of Postcards from the Parks will begin! To all of you that contributed in some way by donating and becoming a PFP Patron Partner, by sharing your stories with me about your experiences in the parks, or by in kind donations to help make this all possible, THANK YOU! I absolutely could not continue to do this work of art activism and public engagement with out you. Stay tuned for the next blog post coming right up from majestic Zion and check out the gallery in the next couple days for new additions!